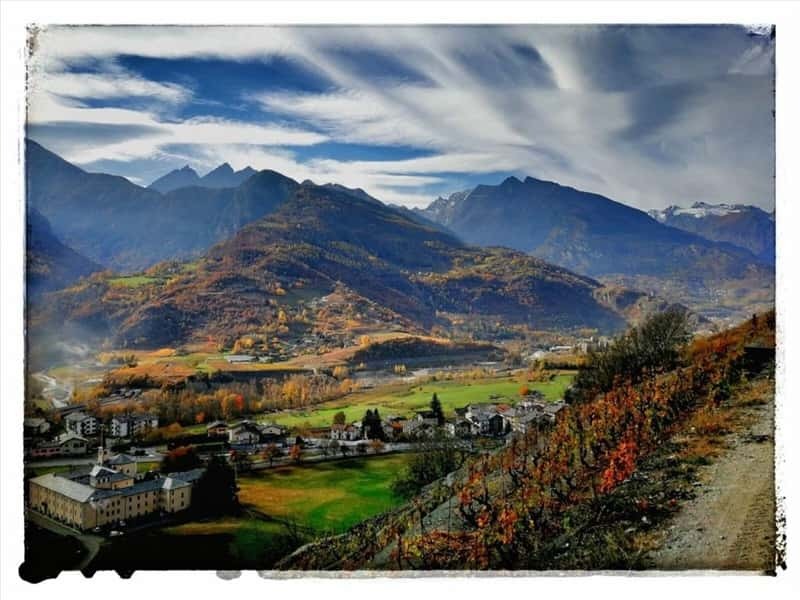 Villeneuve, whose name means "new village", it is a mountain village in the province of Aosta, situated at the confluence of the valleys of Valsavarenche and Rhemes between Aosta and Pre Saint Didier, at 640 meters high. The finding in the Plain of Champ Rotard presents one of the largest Neolithic cemeteries in Italy, with tombs dating back to 3000 B.C., as well as rocks with engravings dating to the Neolithic and, finally, in the village of Martinet the trace of a Neolithic axe, suggests that the area was populated since ancient times. Also the Romans left in Villeneuve traces of historical importance, such as: a stretch of the Via delle Gallie in the district of Champ Rotard, a temple dedicated to Augustus and four funeral rosettes in Chatel-Argent, a stele of the II century A.D. found in the chapel of the castle, a milestone and a Roman tomb in La Crete. After the fall of the Roman Empire, the Val d'Aosta was invaded by the Burgundians, Ostrogoths, Byzantines, Lombards, Merovingians and Franks. This succession of invaders had a strong influence on language. The territory was divided into fiefdoms, including the one of Chatel Argent. The territory also belonged to the lords of Bard, and in 1242, Hugues de Bard rebelled against Aymon Count of Savoy, but had to sell his possessions and withdraw outside the region. After the exile of the lords of Bard, Philippe Ier, Count of Savoy, in 1271, built a new city and he proclaimed Villeneuve, as the capital of the fief. The village was equipped with two entrances. In 1273 the inhabitants obtained from their Count numerous privileges, unusual for the time, which were reconfirmed by Count Edouard and 50 years later in 1376 by Count Amadeus VI. In the first half of the XVII century Charles Emmanuel I assigned the Lordship of Chatel Argent to Pierre Leonard Roncas. The ruins of the Castle of Chatel Argent, strategically located on the site where previously a Roman fort was built to defend the Empire from the barbarian invasions. It was probably destroyed by the Saracens. The castle, which could date back to the year 1000, was built with existing materials of a Roman temple and designed by the architect of the Count Pierre II of Savoy. The name Argentum can be associated with the particular colour of the stones with which it was built, rich in calcite, quartz and mica, which give them their silvery reflections. The building contains within its walls an old chapel dedicated to St Columba. Of the original structure remains the main tower, a water tank and part of the walls. The first owners were the lords of Bard. The church of Santa Maria, today entitled to St. Rocco, was mentioned in a historical document of 1184, and in the following centuries, the building saw the addition of new chapels, but fell into disuse during the XIX century, after the construction of a new Parich Church in 1792. Recent excavations by the Superintendence of Cultural Heritage in the church of Santa Maria have revealed that the same site had been occupied since the Neolithic period. Some relics from Roman times, found here, evidence the presence nearby of an ancient settlement and an early Christian church dating from the V century which featured early medieval and Romanesque elements and decorations. The Romanesque bell tower dates from the year 1000, as well as the crypt. On the left side chapel is kept in a part of the 1200 fresco depicting the martyrdom of St. Maurice. The Parish Church of the Assumption, built in 1792. La Tour Colin in La Crete, dating back to 1200, was probably built on Roman ruins and in the beginning it belonged to the family of Gontard. Maison Carmagne in Champ Rotard, which was built by François Carmagne, commissioner of Count Amédée VII. It consists of two towers: one square that is approximately 700 years and a circular with a staircase of stone. The bridge in the village of Trepont, which was built in the XVIII century, destroyed by a flood in 1993, it was rebuilt in compliance with its original structure. This town web page has been visited 14,136 times.